When he revisited Shanghai in 1991, J.G. Ballard discovered that the Tudorbethan house in the old International Settlement where he'd spent most of his childhood was still standing, although much dilapidated, overshadowed by new tower blocks, and serving as the library of a state electronics institute. Some years later, it was converted to a restaurant; when I visited a couple of weeks ago it had undergone another conversion and extension, and had become a gated private members club. 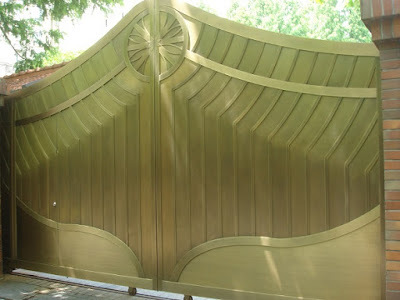 The golden gates to what was once J.G. Ballard's childhood home. The caretaker saw a bunch of Europeans standing around outside and opened the gates for us; I snatched this picture of the regooded original house and its extensions just before he realised we were tourists. Along with fellow author Richard Morgan, I was a guest of the Shanghai International Literary Week, part of a British delegation organised by the London Book Fair. 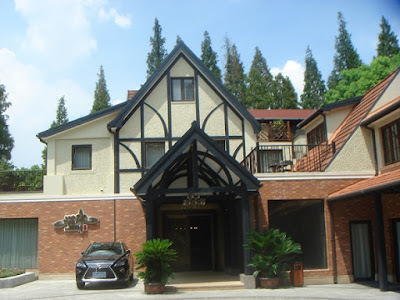 Although the Literary Week focused this year on science fiction, our trek to the house on the former Amherst Avenue (now Panyu Road), was the only acknowledgement of this famous British science fiction writer's association with the city. But perhaps the past wasn't the point. We were staying in the French Concession, a mostly low-rise area adjacent to the former International Settlement, its streets shaded by plane trees, a green island hedged by towers and skyscrapers. 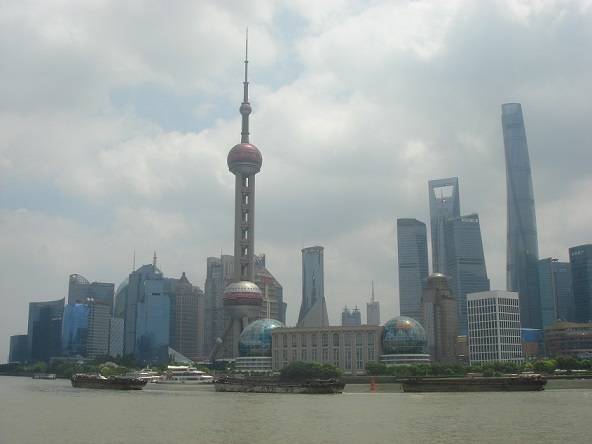 Elsewhere, Shanghai is an enormous ongoing experiment in economic evolution, a simmering petri dish inhabited by more than 24 million people, endlessly reshaped by China's expanding economy and foreign investment. Streets in the French Concession are lined with stores hawking international luxury brands from perfumes to Prada. An excursion to a famous garden in Suzhou involved a two-hour drive through an interstitial sprawl of factories, greenhouse farms, power stations and tower blocks, cut by canals, motorways and high-speed train lines. 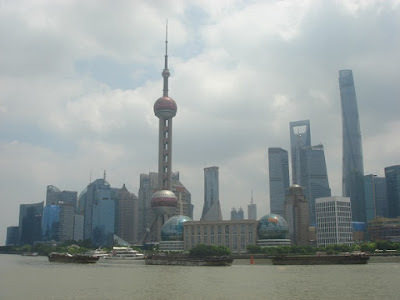 And while Ballard would still recognise the solid grey banks, trading houses and hotels along the Bund on the western bank of the Huangpu River, on the opposite shore thrust clusters of new skyscrapers that dwarf the iconic Oriental Pearl TV Tower. 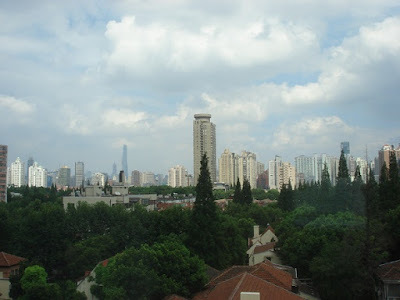 View from my hotel room window across the low-rise French Concession. The Oriental Pearl TV Tower and the Blade Runner prongs of the Pudong shore. One of my events took place in a huge, newly reburbished bookshop in a dockland office development, with tall French windows looking out across the river towards those Blade Runner skyscrapers. The next day there was a poetry reading in the biggest function room of the new W Shanghai hotel, with a railway-station-sized atrium and gold bars stacked on the reception desk like the trademark of a James Bond villain. The local government had invested heavily in the book fair. I didn't get to visit the arena where publishers hawked their wares to the public, but banners advertising the fair and extolling the virtues of literacy were ubiquitous in downtown Shanghai, there were guest writers from Argentina, France, Japan, Russia and the US, and amongst more than twenty Chinese writers Chen Quifan, Fao Yi_Feng, Han Song, Ma Boyong, Wang Jinkang, Zhang Ran, and Wang Kanyu represented the Chinese science-fiction scene. This year's emphasis on science fiction may have been partly down to the international success of Liu Chixin's Remembrance of Earth's Past trilogy (translated by Ken Liu, the first volume, The Three Body Problem, won the Hugo award for best novel in 2015). There was also a story floating around that, because many NASA engineers on the Apollo moonshot program had been inspired by reading science fiction at an impressionable age, the Chinese government was pushing the genre in the hope that it would encourage a new generation of space technology engineers. Weird if true, but it was given some credibility when in his speech at the opening ceremony the Vice-Chairman of the China Writers Association told a charming anecdote about having trouble figuring out how to use a phone-based peer-to-peer system to pay for his haircut, and suggested that science fiction could educate people like him about the future. I'm not certain what the local science fiction writers, who have to navigate the mutable whims of the state-controlled publishing business, made of that, but it's certainly true that science fiction, long regarded as a marginal enterprise with little relevance to the present, is currently undergoing something of a renaissance. Yet although Chinese science fiction has a reputation for leaning towards traditional hard sf (and Liu Chixin's trilogy bristles with familiar hard sf tropes, from alien invasions and international conspiracies to space battles and virtual reality), it is as various and disputatious as the Western kind. Ma Boyong's The City of Silence is a dystopian satire in which the protagonist searches for human connection in a world where language has become fatally attenuated by control of the internet and face to face interactions; Han Song's Subway is a critique of China's unthinking embrace of modernisation and Western technology, in which descendants of space explorers returning to Earth find themselves trapped on a non-stop train; in Zhang Ran's 'The Gloomy States' stories, use of different technologies has shattered countries into a patchwork of independent states. If you want a taste of that variety, Clarkesworld magazine is currently publishing a regular series of translated stories by Chinese writers, or check out the anthology Invisible Planets, edited by Ken Liu. At that bookshop event, Richard Morgan and I shared a panel with Wang Jinkang. Along with Liu Chixin and Han Song, he's one of the Three Generals of Chinese science fiction and has impeccable hard science fiction credentials: an engineer whose novels and stories deal with speculations about core science-fictional tropes such as biotechnology, artificial intelligence, god-like aliens, and virtual reality. Even so, as he made clear in the panel, he's more interested in the ethics and philosophical problems posed by biotechnology and AI than with the nuts and bolts of the actual science. In the end, like all the good stuff, Chinese science fiction isn't concerned with handbooks or guides to the future that's already all around us, but with a host of imagined futures that mirror and distort the concerns of the present, and the human stories that can be found there. An appreciation of the late, great Brian Aldiss, published in Locus. Dave Langford's Ansible has also published a fine collection of tributes. The photograph was taken by Steve Jones at a signing in the World Science Fiction Convention, London, 2014. Brian’s productivity considerably outran that modest ideal. In a writing career spanning more than sixty years, he published fifty novels and around thirty short-story collections, as well as memoirs, plays and volumes of poetry, essays and criticism. He also edited numerous anthologies of SF stories, including the three hugely successful Penguin anthologies that, still in print today, comprise a definitive overview of sixty years of science fiction history. His career as an SF writer began in the 1950s, when the genre was still dominated by the big beasts of the Golden Age, almost all of them American. He invigorated over-familiar tropes with a distinctive, wryly British slant, and like Olaf Stapledon and HG Wells, some of his best works are unsentimental but not unsympathetic depictions of humanity’s petty triumphs and foolishness set against enormous backdrops of time and space. Galaxies Like Grains of Sand is a series of interlinked stories that spans forty million years of human history; Hothouse (aka The Long Afternoon of Earth) is a lush, melancholic vision of the deep future, when humanity and its works have become little more than ghostly memories, and our distant descendants have been stripped by evolution of unnecessary intelligence, and struggle to survive in the mazy branches of a vast world-tree. Hothouse, published in 1962, is one of my all-time favourite SF novels, as is Greybeard (1964), a pastoral apocalypse set some fifty years after humanity was sterilised by nuclear bomb tests. And let’s not forget Non-Stop, The Dark Light Years, Cryptozoic! Earthworks . . . It was my great good fortune that my personal golden age as an avid teenage SF reader coincided with Brian’s golden age as an SF writer. As the British New Wave developed he embraced a range of experimental techniques, from the fractured language of Barefoot in the Head to the infinite regression of observers in Report on Probability A, but his masterpiece, the densely imagined Helliconia trilogy, is superficially more conventional, describing the rise and fall of civilisations on a planet whose seasons span centuries, a perfect synthesis of pulp SF and serious speculations about cycles in history. By then, he’d also published two series of literary novels, the Squire Quartet and the rambunctious, best-selling Horatio Stubbs trilogy. And while many of his later novels were similarly character-led, he continued to be a prominent figure in SF, genial, generous, tirelessly promoting the genre as a serious literary endeavour. 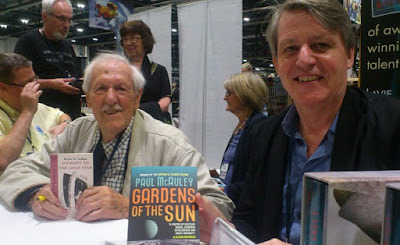 The last time we met was at the World Science Fiction Convention in London, where we shared a signing table for an hour and I watched him treat a stream of fans with gruff good-humour, Afterwards I had him sign my first edition of Helliconia Spring. To Paul, he wrote in a typically generous gesture, with much love. Hard to think that his ebullient imagination and busy pen are finally stilled.